For those who have never been, Boulder may conjure up images of University of Colorado students strapping on skis to get through the snow to class, but the city offers many attractions beyond the winter months. Springtime in Boulder can still mean snow (March is the snowiest month in Colorado), but it typically melts off quickly and there are enough warm days for visitors to sip a Saison on a patio while tulips emerge from planters nearby. As you drive from Denver to Boulder on Highway 36, a set of sharp slanted rock outcrops on the Rocky Mountains come into sharper view—the Flatirons. The sandstone formations offer a striking backdrop during a visit to Boulder. The city sits at an elevation of 5,430 feet and offers a gateway to the mountains for visitors and its approximately 100,000 occupants alike. Boulderites—one-third of which are between the ages of 18 and 24—are known for their enthusiasm for the outdoors and a healthy lifestyle, and the city has good options for foodies and beer enthusiasts. The bike and pedestrian-friendly nature of the city also makes it easy for travelers to navigate. You’ve seen it as the backdrop for much of Peter Jackson’s Middle Earth in the Lord of the Rings trilogy. You’ve heard of the majestic fjords, the misty mountains, and the endless lakes in shades of blue not found anywhere else on Earth. New Zealand’s South Island is all of these things, but these are just the beginning. The proclivity of the locals to lean toward the extreme—bungee jumping was invented here, for example—is matched only by that of the island itself, located on the famed Ring of Fire and home to some of the most devastating earthquake activity found worldwide. Many believe the South Island is less inherently New Zealand than its northern neighbor, but if you take the time to explore this stunning landscape, you’ll find that it has a personality all to its own. There’s something in the River Avon’s waters. Nestled in the hills of the West Country, next to the river, the city of Bristol has a youthful, offbeat character that distinguishes it from any other English city, and a creative and cultural output to rival that of the capital. Set around a harbor and once a major center of maritime trade, Bristol is home to many sites of historic interest—from its iconic suspension bridge to the ground-breaking steamship, the SS Great Britain—but has become better known over the past few decades for its thriving arts scene. Bristol is the birthplace of street artists Banksy and Nick Walker, as well the eternally popular Aardman Studios, creators of beloved plasticine characters Wallace and Gromit, and the “Bristol Sound” music scene, which gave us bands like Massive Attack and Portishead. They may just be 18 little specks in the North Atlantic Ocean, suspended midway between Iceland and Scotland, but the tiny Faroe Islands are fast gaining long overdue recognition as the new Nordic hot spot, as much for their music and cuisine as their breathtaking scenery. As Iceland, the archipelago’s close neighbor, becomes increasingly overwhelmed by tourism, the Faroe Islands offer comparable otherworldly landscapes and distinctive island culture, but on a smaller and (as yet) far less visited scale. The number of visitors to Lisbon has grown rapidly in recent years. Maybe it’s the generally sunny weather. Maybe it’s the crenelated, stone castle almost always in view on the hill overlooking the center of the city. Or maybe it’s the buildings lining the often-winding streets covered with the colorful tiles, azulejos, for which the region is renowned. Whatever it is, the magical feel appeals. Lisbon also has affordability going for it; it’s relatively cheap compared to other European destinations, especially when it comes to food. Though less glamorous than some cities, new infrastructure investments promise up and coming sparkle. And as tourism has offered a bright spot in an otherwise fairly depressed economy, the government has upgraded transportation, and new hotels have sprung up around the city. In short, this destination, which has never been more popular, will keep travelers busy and well-fed. Less than 15 miles from South Bali’s party capital Kuta, the traffic thins and the scenery shifts from bathing suit shops and hotels to the thick, electric green rice fields of Canggu. Canggu refers to a five-mile coastal stretch north of Seminyak and south of Tanah Lot, but the heart of Canggu is at Batu Bolong and Echo Beach. Though it is largely rural just a few blocks from the shoreline, the area is being quickly developed by expats who couldn’t part with island life. For now, though, Canggu is basking in its tourism sweet spot: visitors surrender to the rhythm of local Balinese life, while still being able to enjoy the occasional almond croissant or chia seed smoothie—the sort of indulgences you might crave if you, like most people who come to Canggu, end up staying awhile. The typical morning begins by the water with a freshly hacked coconut to hydrate you before the South Pacific sun comes down in full force. Surfers are bobbing in the water by sunrise, waiting to catch the day’s first waves, and—depending on the current that day—you can watch locals teach their children to surf before school. By 6 p.m., the entire town convenes by the water to watch the sunset; savor it with a cob of sweet-chili-dipped corn and a bottle of Bintang (the local beer). “It’s not easy to find.” Reviews for every attraction in Marrakech’s old city, known as the medina, usually begin with a similar warning. Maps and navigation apps are fairly useless here, which is an indelible part of the Red City’s charm. From the desert a vast earthen city emerged nearly a thousand years ago as the central spoke of a trading empire. The strategic location ensured threat of invaders at every turn, so architectural ingenuity provided the key to defense. A dense tangle of narrow alleys was designed to snake through foreboding, indistinguishable sandstone structures rising above to shield the sun’s orientation. Today the effect is the same on travelers as would-be invaders: dizzying disorientation. Fear of navigating the city’s maze and cultural customs often sends first-time visitors seeking package-tour comfort. For independent travelers, Marrakech’s greatest delights can be found by giving up control and embracing the beguiling bewilderment. From colorful markets to snake-handlers in action, every exotic inch is a photographic dream. Be mindful of respecting culture and customs by asking permission before taking photos of people. After all, as exotic as the city is for visitors, for the people of Marrakech, this is home. Hidden amongst the fog and mists of the South China Sea is Hong Kong, a city of a million faces and personalities. It’s Chinese, but it’s not China. It’s British, but no longer part of the Commonwealth. It’s Asia, but more diverse than most western cities. This port city, which is made up primarily of Hong Kong Island and mainland Kowloon, serves as many travelers’ first foray into Asia and is perfect for those seeking a taste of the colonial old with a large spoonful of the new—on steroids. Without a doubt, Hong Kong is the ideal destination for anyone with a keen eye and an adventurous appetite. A sightseeing tour of Paris seems like a no-brainer. Snap signature selfies in front of the Eiffel Tower (or up in it); stroll down the infamous Champs-Élysées and head up to the top of the Arc de Triomphe for that classic Instagram shot; and cross the Louvre, Musée d’Orsay and Catacombs off the checklist. Even in two days, you can make the rounds at all the major landmarks (and still indulge in plenty of wine, cheese, baguette and escargot). But then there’s the side of Paris captured so dreamily in films, Hemingway novels and the prose of chanteuse Edith Piaf. We’re here to help you fit it all in. Founded in 1797, Asheville grew slowly with the expansion of the railway system in the south and came to national prominence with the completion of the Biltmore Estate—still the country’s largest private residence—in 1895. Today, with a population of fewer than 100,000 residents, Asheville has been called the “Paris of the South” and has made a name for itself in the national craft beer scene. The year-round resort town is home to all kinds—creative types mingle easily with the fleece-clad mountaineering set who cross paths regularly with the area’s longtime farmers. One of the prized jewels of the South, Asheville is a living, breathing city that grows and changes daily. Here we offer you a snapshot of the city’s best experiences to have over a few days in this eclectic town. Paraty—which in Tupi, the language spoken by indigenous Guaianás people, means “river of fish”—is a gorgeous little colonial town roughly halfway between between Rio de Janeiro, São Paulo, and Belo Horizonte. It’s the perfect small-town refuge from Brazil’s big metropolises. The Portuguese arrived to the area in the late 1600s, setting it up as an important trading post for exchanging minerals extracted from the Brazilian interior by slaves for finished goods like sugar and wine. Today, Paraty is a placid fishing town with a tourist-friendly colonial city center and a laid-back downtown. There are plenty of decent, affordable hotels and restaurants, while tour operators offer trips into the surrounding mata atlântica forest and the gorgeous blue-green bay. America lifted its sanctions on Iran earlier in 2016, and you know what that means: Iran is the trendy new place to go. Well, not exactly, but it’s getting there. Tehran actually reminds us a lot of New York City; underneath all that concrete lays a liberal city. The only differences (OK, there are a lot of differences) are its age and rugged backdrop: the Alborz Mountains. Despite all its political madness, the Iranians are recognized by the United Nations as having created the world’s first charter on human rights. Not unlike GOT's Mother of Dragons, when Cyrus the Great (the original King of Persia) conquered Babylon in 539 B.C., the first things he did were free its slaves, allow everyone to choose their own religion and establish racial equality. Cyrus’ ideas spread quickly throughout the world—first to India, then Greece and eventually Rome. Point being, no matter how crazy the country’s politicians might seem, Iranians are good eggs and it’s a culture definitely worth exploring. With about a million residents, Sweden’s capital feels much bigger than its population suggests. Although Scandinavia can be undeniably pricy, there are plenty of cost-effective ways to enjoy the capital of Sweden. Stockholm’s rich cultural history and evolving food scene are enough to warrant a trip; throw in sustainable design and a plethora of green city parks, and you have yourself a well-balanced vacation. Every year Zagreb, Croatia's main city, grows in popularity. And, with each year, it further secures it’s spot on the must-see travel stops in Central Europe. As you exit the train station through a series of double doors and see the statue of King Tomislav, the county’s first king, and the Cathedral steeples standing tall in the distance, prepare to take this tour to the places every newbie needs to know to enjoy this burgeoning capital. What you'll soon learn is there is much more to this city, and the country, that its proximity to the Adriatic coast. Outstanding food, wine, museums, and theaters are all there for the taking. A unique blend of chic cosmopolitan style and rugged outdoor adventure, the city of Santiago, Chile is as multifaceted as the people who call it home. Towering skyscrapers are flanked by snow-capped mountain peaks and bustling nightclubs are nestled beneath swaying palm trees. The charm lies in the balance—the perfect marriage of nature and urban sprawl. Despite being the capital, Santiago doesn’t see a whole lot of tourists—and you’d be hard pressed to find more than a few handfuls who speak understandable English. It’s a city deeply rooted in its heritage and history, and to understand and see it, you almost need to speak the language or have a guide. It’s a place built for strolling for hours without care through the glamorous barrio of Bellavista to the bustling La Vega Market. Thanks to the lack of tourists, you can easily get off the beaten path—even in the center of the city. So, whether you’re staying for a day or a week, get lost in Chile’s capital by sinking your teeth into the mouthwatering food scene and the magnificent culture. I am proud of Paste Travel. (Hell, I’m the editor … what else would I say?) 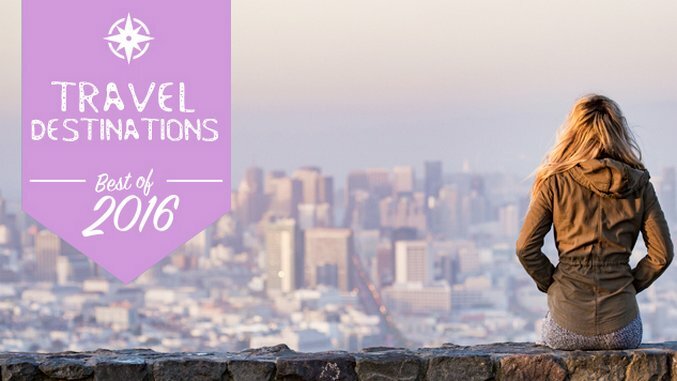 We covered hundreds of destinations for millions of readers this year. Conservatively, we’ve published more than 700 articles. Those included features, lists, galleries, and industry news. The energy it takes to create that volume—which has to be right up there among the most productive, purely travel, sections anywhere—comes from a team effort that includes an incredibly and talented dedicated group of interns, regular columnists, designers, photographers, freelance writers, and editors. Like last year, the Paste Travel team wrangled stories from all seven continents. We published pieces from locals living in small towns and insiders filing from big cities. Our stable of writers brought home adventure articles and dispatches from the best bars and restaurants on the planet. They also gave us insight about where to downshift after coming off the side of that mountain, drinking one too many martinis at that lounge, and strutting the walk of shame after swinging from a chandelier with a fringed-leather vest, an eyepatch, and a parrot named Tony. No, I won’t say which writer this was. But seriously, we need to party. I hope, in 2016, you had the opportunity to discover new spots that you now call your own. Even after 20 years as a travel writer and editor, I still feel the constant tug of the road. I still feel the need to be on a journey—regardless of where the plane, bus, car, train, wagon, rickshaw, bicycle, or pair of boots takes me. I am keenly aware that life is very short and very precious indeed. Below, and in the gallery, is Paste’s selection of places we cherished this year. I hope several make your travel list in 2017. 1. Boulder, Colorado; 2. South Island, New Zealand; 3. Bristol, England; 4. The Faroe Islands; 5. Lisbon, Portugal; 6. Canggu, Bali; 7. Marrakech, Morocco; 8. Hong Kong; 9. Paris; 10. Asheville; 11. Big Sur, California; 12. Paraty, Brazil; 13. Western Big Island, Hawaii; 14. Stockholm, Sweden; 15. Zagreb, Croatia; 16. Santiago, Chile.